No way, that’s good soap in there! Just put it back on the counter and let it dry out. The leftover lather will reconstitute into soap that you can use next time! It is, however, a good idea to rinse out your shaving brush with warm water. Do the Math. Safety razors take blades that cost $2 for 5, or 40 cents a blade. If each blade lasts 5 shaves that’s 8 cents a shave. How much was your last drugstore razor and blade purchase? Watch what you are Throwing Out. Drugstore cartridges are composed of a number of different plastics and metals that cannot be separated and recycled. Disposable razors are even worse. Our safety razors take individual blades that are recyclable (check with your community recycling program on how to recycle sharps)! The Brush Makes all the Difference. Canned shave foam is full of chemical ingredients and can contribute to razor burn and ingrown hairs. Our all-natural shave soap is formulated to moisturize your skin while the shaving brush distributes lather evenly and helps raise hairs for a closer shave. A brush exfoliates skin, removing dead cells and leaving skin properly prepared for your shave. Quantity Does Not Equal Quality. As you draw a 5 blade cartridge over your skin, the first blade acts as a snowplough, dragging your shaving cream with it. Now, multiple blades are shaving unprotected skin; that is like dry shaving over and over again every time you use that razor! The result: irritated skin smeared with a gooey substance deposited by your cartridge to camouflage razor burn. It is an Art. Wet shaving is all about slowing down enough to get a quality shave that you enjoy rather than rush through. It allows you to customize a shave routine that suits you perfectly. And man oh man does it ever look cool. with a shower. This fully moisturizes the skin and makes your hair softer and easier to shave. and rub it into your pores. Skin should be damp when you apply lather. thick and white, but few bubbles. your skin against the grain of your hair growth (this lifts the hair so that it is easier to cut). thumb and a few fingers. For men, it is best to start by shaving the entire face with the grain. women, however, shaving against the grain on the first (and usually only) pass works just fine. cream/lotion/balm that cools your skin and leaves it moisturized is perfectly fine. I love vintage razors and I have tried almost every style. I love double-edged razors for their versatility, injectors for their speed, and straights for their incomparable closeness… but this week I found my perfect leg-shaving razor. The GEM Micromatic is a slick looking single-edged razor with some weight to it – 64 grams to be exact. It is a twist-to-open style (perfect for me since I tend to lose removable razor heads) that takes standard GEM single-edged blades. The Micromatic was manufactured for a few decades between the 1920’s and 40’s and came in a wide variety of packaging, from hinged Bakelite and leather cases (some lined with velvet) to brightly cololured cardboard boxes. It was never marketed as a women’s razor, but after my test run, I believe it should have been. My brush of choice was my silver-tipped badger hair set in pink acrylic, made by none-other than my husband, Brad. I used a wonderful shaving soap that was hand-made by a Vancouver Island soap-maker, Dragonfly Dreaming. I love this soap because it is all-natural, lathers quickly and with a lot of body, and is extremely gentle on my sensitive skin. The weight and angle of the Micromatic did all of the work for me, gliding smoothly over my skin. As usual, I over-thought my knees, shaving with the blade more perpendicular than parallel to my skin and that caused a bit of irritation around that bony area. As with most single-edged razor, the Micromatic’s head is angled exactly right to guide your shave – you simply move the head of the razor flat against your skin. In future, I will adhere to this rule more strictly when using the Micromatic around my knees. On the rest of my legs the Micromatic was flawless. It was a very quick, 1-pass shave and there was no razor burn or red bumps at all. My overall result was amazing! I am thrilled with this razor for many reasons, the main one being that I shaved my legs 3 days ago and they still feel like day 1! For me, that is better longevity than what I get with a straight razor shave (the king of all shaves, ever). I have used more brands and models of razors than most women (and men) out there, and the Micromatic has quickly become my favourite for a smooth, long-lasting shave. I still believe that a double-edged razor is fantastic for its ease of use and versatility, and that injectors are an extremely quick and easy shave, but when I am looking for a slightly more involved, but long-lasting shave, I will definitely turn to my Micromatic. It should be noted that Brad also tried this razor and his results were not nearly the same as mine. He found that the razor had a hard time manoeuvring around corners and bony areas of his face – similar to that of my knees. For that reason (it’s lack of agility around bumps and bones), I think the Micromatic is perfectly suited for the long, straight area of a woman’s legs. The shaving brush is vital to a good shave. Why? Firstly, shaving foam from a can is gross. Canned foam is largely made up of air bubbles and therefore has a very hard time lubricating and protecting skin. Foam also tends to soak into skin, leaving an itch causing residue when you rinse. Throw a shaving brush into the routine and you open yourself up to a whole new world of shave soap possibilities (see our SOAPS & SKIN CARE information and products)! A shaving brush works hard to lather good quality soaps and creams into thick, skin protecting lather. Without a brush, soaps and creams just are not the same. 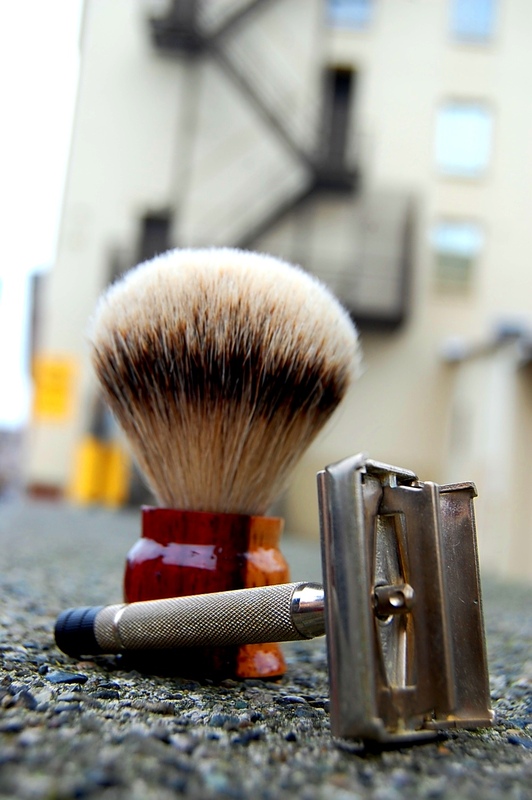 The second reason you need a shaving brush? Exfoliation! The bristles of a shaving brush effectively remove dead skin cells right before you shave, ensuring your razor has the clearest path possible. Thirdly, you should also use your brush to lift your hairs (by running your brush against the direction of hair growth after you lather) so that your razor slices through them, rather than over them. By using your brush to lather soap, exfoliate skin and lift hairs, you can go from a mediocre shave to a “feel how smooth!” shave. Who knew such a little brush could do so much! All Brushes by The Copper Hat are lathe-turned by Brad or Kate. Each brush handle design comes from our imagination, we never use patterns. We usually turn wood, but are also venturing into materials like acrylic, stone and nylon. Every wood brush is sealed with marine-grade epoxy, keeping it water proof for years to come. (We always welcome custom requests: have a piece of your childhood kitchen table or climbing tree? 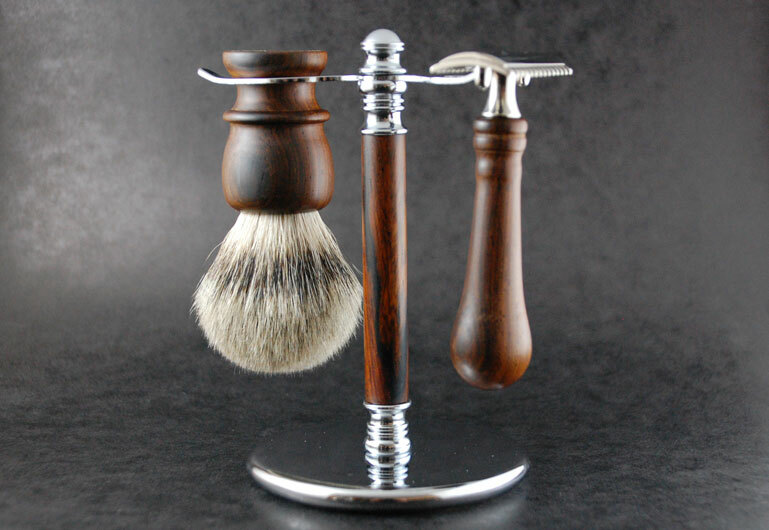 We can turn that into a beautiful shaving brush handle). Currently, we set all of our brushes with silver tipped badger hair, the highest quality available in shaving brushes worldwide. 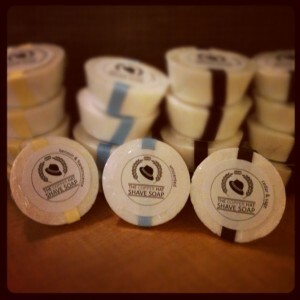 Badger hair is extremely soft and is perfect for lathering all soaps and creams. It is excellent for exfoliation while being gentle on skin. We use badger hair from China, where badgers exist in great numbers and are considered pests, and are therefore killed. We are, however, beginning production of horse hair (sections of hair cut from the horses tail while alive) and synthetic fibre brushes. In the description of every brush you will read its size (ex: 22mm) and loft (ex:57mm) in millimetres. The size is the diameter of the circular knot of bristles that was set into the brush handle. Typical brushes are between 18mm and 22mm, with bigger sizes lathering faster, holding more lather and covering more skin per lather. The loft is the height of the bristles measured from the top of the handle to the top of the highest bristle. A short loft will result in slightly stiffer bristles (great for lathering hard soap) compared to a taller loft that will be a bit more floppy (better for lathering cream). Most of our 22mm brushes have lofts between 52mm and 58mm and are excellent for lathering both soap and cream. To ensure your brush lives a long life, it is important to care for it properly. Always hang your brush upside down to dry when you are done using it. We offer the handy option of embedding your brush with a magnet so it can hang under your towel bar or medicine cabinet. Don not have a towel bar or medicine cabinet? We also have brush stands. When you soak your brush before use, only leave it in the water for about a minute. Rinse your brush in warm water when finished, and don not pull hard on the bristles. 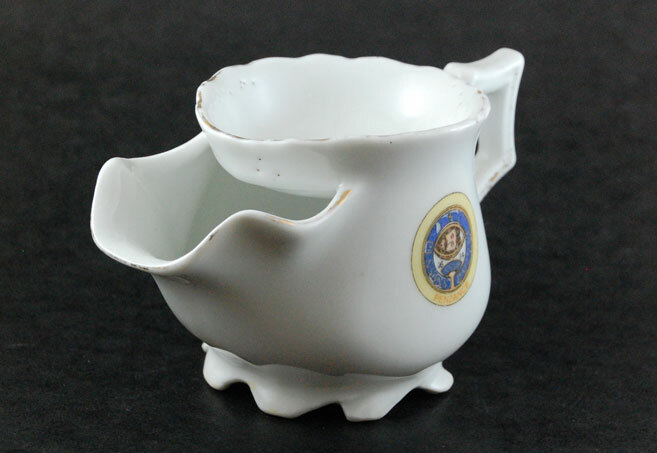 Some shedding of bristles should be expected on the first few lathers. If you are using a shave puck (a hard bar-type soap), put the puck in your lathering bowl/mug and fill it with warm water for a few minutes. Soak the bristles (always pointing down) with warm water either in the stream from the tap or in another bowl/mug (this will fill the bristles with water and help lather the soap). The brush only needs to be soaked for 30 seconds or so. Before lathering, shake most of the water off of the brush and empty the water from the bowl containing the puck. Next, swirl the brush around the puck of soap quickly until lather appears (if you are using a cream from a tub or tube, put a quarter-sized amount into your bowl to lather). A good lather should take about 1 minute to build. If it seems like not much is happening after a few seconds, add a few drops of water. If the lather is very bubbly, there is too much water in the mixture and you should shake the brush out a bit more. The optimal lather will look just like whipped cream – fluffy, thick and white, but few bubbles. Make sure your skin is damp, then swirl lather onto your skin moving your brush in a circular motion. Once you have distributed a thick, even layer over your skin (you may choose to go over the same spot with your brush more than once), pull your brush over your skin against the grain of your hair growth (this lifts the hair so that it is easier to cut). 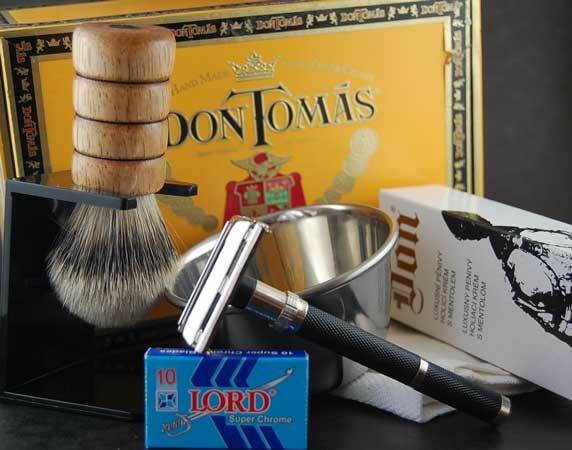 We realize that for those who are new to wet shaving, it can be an overwhelming routine to set up! What razor will work best for me? What kind of blades do I need? What is a brush for? Where can I find the best soap for my skin? We have tried to make the transition into wet shaving simpler for you by supplying all-in-one wet shaving sets that include everything you need to get started. Our sets are definitely not just for beginners any savvy wet shaver who is looking for some new and unique products will be interested in taking a look. 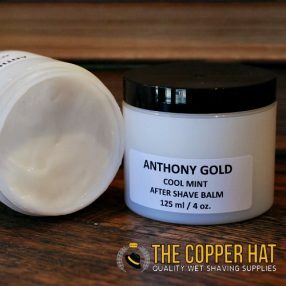 Why Make The Switch to Wet Shaving? Modern razor blade cartridges are a waste of money. Currently, a mainstream drugstore charges $16.99 for 4 cartridges. That’s $4.25 a blade. We used to use cartridge razors and we found that each cartridge lasted about 5 shaves. 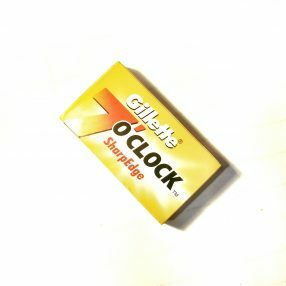 So if you shave every second day, that’s $154 a year spent on razor blades. At The Copper Hat, most of our double edged blades are $2 for 5, that’s 40 cents a blade, meaning $15 a year spent on razor blades. If you shave with a double or single edged razor, blades are $14.56 a year. That’s a $139 difference. Every cartridge that is thrown out from a drug store razor is composed of a number of different plastics and metals that cannot be separated and recycled. Disposable razors are even worse. By using a Copper Hat double or single edged razor you ensure that the only thing you ever replace is a single blade and the joy in that is that the blade is one metal that can be recycled (check with your community recycling program on how to recycle sharps). While it is easy (and necessary) to toss out your cartridge razor handle when styles change and it is no longer compatible with blades, our razors have used the same blades for decades and are much too beautiful to throw away. And hey, if you get a straight razor, you will never have to worry about blades anyway! Also, by taking in one of our vintage razors, you are helping us keep the wet shaving tradition alive and keeping safety razors out of glass cases everywhere! The most important part of the wet shave is arguably the brush. Canned shave foam can contribute to razor burn because it is composed mainly of air, making it so light that a razor blade can easily shave under, not through it. Traditional shave creams and soaps are formulated to prep and condition your skin while the shave brush distributes product evenly and helps raise hairs for a closer shave. A brush exfoliates skin, removing dead cells and leaving skin properly prepared for your shave. Not only does the brush assist in skin preparation, it also allows you to discover endless shave specific soaps that don not smell like generic body spray. As you draw a 5 blade cartridge over your skin, the first blade acts as a snowplough, dragging your shaving cream with it. Now, multiple blades are shaving unprotected skin – that is like dry shaving over and over again every time you use that razor! The result: irritated skin smeared with a gooey substance deposited by your cartridge to camouflage razor burn. Wet shaving. It just sounds cool. And it is; it is all about slowing down enough to get a quality shave that you enjoy rather than rush through. When you begin to wet shave you discover an array of razors, blades, brushes and soaps with which you can customize a shave routine that suits you perfectly. There are so many combinations that half the fun is in finding your next favourite razor or aftershave. Not only does wet shaving give you the ability to personalize your routine, it also allows you to display it. How many people are proud to exhibit their plastic cartridge razor and can of foam on the bathroom counter? I bet you would rather show off a nickel plated twist-to-open double edged razor, mug of bay rum shave soap and custom turned ebony shave brush? We would. The Copper Hat is a husband and wife endeavor situated in Victoria on beautiful Vancouver Island, BC. We created The Copper Hat because of our own frustration that came from shaving with typical drug store supplies. We each struggled with extreme skin types, one oily and one sensitive & dry. We were overwhelmed by the increasing cost of multi-blade cartridge razors and the terror cheaper razors reigned on our skin. When Brad started a job that required him to be clean shaven every day, he took matters into his own hands. He tracked down his first vintage double-edged razor and a shaving brush and, for the next several months, his most common saying to Kate was “feel how smooth my face is!” After observing Brads excitement, Kate began wet shaving and could also never go back to the drug store habit. We started The Copper Hat because we know that we are not the only people who are tired of spending too much money on large blade cartridges that will just be thrown away. Although recent technology has brought us 5 blade razors, vibrating blades, and razors with built-in shave foam, the finesse of this personal care routine seems to have been lost in the fast-paced chaos of our daily lives. We stock high quality razors, blades, soaps, and other shaving supplies so that you can enjoy a personalized shave that is suited to your hair and skin type. Our goal is to help you feel the benefits of shaving with high quality products, whatever skin type you have, without spending a fortune. 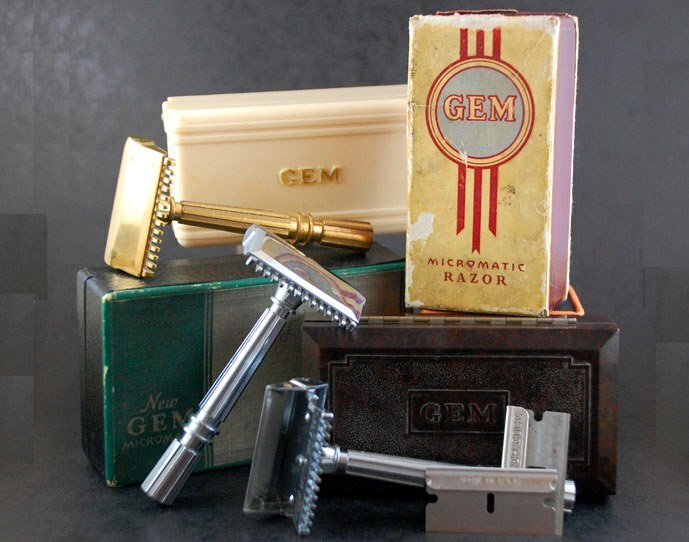 For that reason, a number of our razors are vintage, but still in excellent shaving condition. Not only are they more economical than many new safety razors, they were also crafted with time-tested materials and each has its own history. 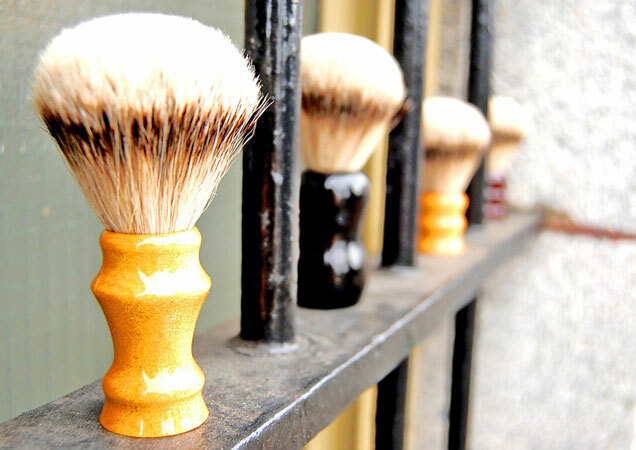 Alongside our razors we stock our specialty product, our very own lathe-turned shaving brushes. We turn most of our brushes from wood, but we are also delving into the world of stone, acrylic and nylon. Our high quality brushes are set with premium silver tipped badger hair, and we are also beginning to work with synthetic bristles and horse hair. Please take a look at our “What is Wet Shaving?” section to learn all about this skin care lifestyle. Thanks for stopping by and Happy Shaving!